Greetings in the name of God and Jesus Christ. Blessed are you, my friends; blessed is this hour. My dear friends, I have been speaking to most of you for over a period of months, but I have not yet mentioned Jesus Christ, who he is, and what he has done. At this time of year, when you are celebrating the birth of Christ, I feel my choice of this subject is an appropriate one. Not only is the light of Christ spreading within the earthly sphere, but also in the spiritual world. You may say, “But in the spiritual world there is no time,” and this is true. This is difficult to explain. After a certain period, which is drawn out much longer in the spiritual world than on earth—according to your human calendar after a year—the light of Christ returns with renewed force in remembrance of the greatest deed that has ever been accomplished. The light is so strong, so penetrating and glorious, that it is unimaginable. There is such bliss, such rejoicing, such happiness and such wisdom coming from this light! For wisdom and light are one. In your human language you call it enlightenment. In the spiritual world, light and knowledge and love are all one and the same. At this period the light of Christ penetrates down to the lowest spheres of gloom, and at least to some small degree into the world of darkness. There may be just a gleam of it, a small sheen, a glimpse of light, yet the influx is there; and at this period when the beings living in the world of darkness encounter the light, they have a different reaction to it. Those who are ready to advance spiritually will welcome the light and will follow it. Others who are not that far advanced yet will cringe away from it, for it is very painful to them; it causes an extreme pain they cannot stand. Therefore, a human being who has succeeded in bringing out the light from within, for it is one and the same light, will be protected against creatures from the world of darkness. Again and again I see that human beings think or feel, “Why was he chosen? If he is the son of God, so are we all children of God. Why should he be better, more exalted, or higher? Why? This is not just.” These thoughts and feelings are often lurking in the souls of human beings even if they do not dare make them conscious. Therein lie the seeds of the Fall of the Angels. This very thought or attitude, which started long before the material earth existed, caused the coming into existence of disharmony and evil. Certainly, no one who had such a thought at the time realized the danger or the possible results of such an attitude. No one actually realized that in this jealousy lies a lack of faith in God and in His capacity to love. For even though God created His first son as the highest of all beings and gave most of His substance to him, if you have the trust and faith the Creator deserves, you will not think that this was unjust or that you lack anything. Nowadays people do not carry these thoughts quite so far; nevertheless, that slight feeling of resistance against Christ in a number of people represents the germ of the Fall and the germ of evil. In what way has Jesus Christ saved humanity? In what way was his deed the greatest? What was the purpose of his life on earth, his one-time incarnation? The purpose of his life was not only to spread his teachings; for true and beautiful as they are, basically the same teachings could be found elsewhere too, though perhaps in another form. So this was certainly not the only purpose. The second purpose of his life, though still not the main one, was to show symbolically through his life and death the course and the stages of development for each person who wants to regain the kingdom of heaven. Periods of testing, trials, faith in God in times of adversity, crucifixion of the personal ego with its vanity and self-will: all this was symbolized by the body of Jesus. The resurrection of his spirit signifies the life eternal of bliss and happiness for the spiritual essence of each individual after the ego has been crucified. This cannot happen otherwise than through pain. But even this part of his task is not the main and most important one. The two purposes mentioned here can be considered as accompaniments to the main purpose he had to fulfill. At a future date I will describe in greater detail how his main task meant salvation, for he was the Messiah! Right now, I want to say this to you: If Jesus had failed, another spirit would have tried to fulfill the task; for it was not certain beforehand that Jesus would fulfill it, even though he was the natural and logical choice. Someone had to come to earth and go through all the sufferings completely alone, at certain times barring all divine protection, and resisting all evil and all temptation out of his own free will. Only in this way could the spiritual laws continue to remain unbroken so that in a spirit of justice each individual and even the very forces of evil could find the way back to God. God is the power, and with His power he could certainly have done anything, including breaking His own laws. Had He done this a great number of creatures who were not yet ready to find their way back would have been permanently separated from God and from an eternal life of bliss. That might have included any one of you. Only by the vast and elaborate Plan of Salvation is it possible that down to the very last of the fallen creatures everyone can at one time find the way back to God. This is difficult to understand now, but in the future I will explain it in more detail. For the present this should suffice to give you an idea of how extremely grave and serious the task was. Only understanding this will keep people from ever saying that God is unjust or that God has used His own power to break His own laws. Naturally, God’s power has to be the greatest. No one will be able to say that God has used this power to violate His gift of free will given to each and every individual. The supreme justice of this solution could only happen through the fulfillment of such a task. Thus, no free will was broken and no power used unduly. Jesus Christ has proven this. Naturally, the question may come up, “Can we find and reach God, and can we attain perfection only through Jesus Christ?” The answer, my friends, is, “Yes and No.” It is one of those apparently paradoxical cases where both answers are correct. I will try to explain how this is. You can reach a stage of development through every one of the great world religions, including the non-Christian ones, in which you can experience absolute truth. No spirit of the world of God will ever tell you to leave your church or your temple or your faith. For if you have found what you seek and need in the way of happiness and spiritual food in the faith you are accustomed to, remain there: enough of basic fundamental truth and enough of what you need for your spiritual development is contained in all the great religions. It is up to you to find out what the truths necessary for your personal development are and then to put them into practice. When I speak of satisfaction with your faith, I do not mean the satisfaction of your surface conscience: that is not enough. But if you follow the teachings of your religion whereby you learn and do what alone matters, namely work for self-knowledge, self-purification, and utter self-honesty, then the religion to which you belong or which you have chosen will satisfy your spirit. The purification of your lower self and the crucifixion of the ego are the all-important things. Where you are able to find the necessary help, guidance, and inspiration to accomplish this does not matter much, even if for many reasons you cannot recognize Christ in a religious affiliation. By self-purification alone, you will raise your consciousness to such a degree that you will be open for truth in all its aspects concerning the part Christ played in the history of Creation, or concerning anything else for that matter. So, in this respect, the answer is “No” to the question whether it is only through the recognition of Jesus Christ right now that one can reach God. The perception of absolute truth in any respect can only happen through a process of self-purification over the lifetimes. Unfortunately, few people are doing that. Anyone going though the difficult process of self-purification will prepare the ground for becoming able to receive and experience absolute truth in all its facets, whether some of the recognition takes place during this incarnation or, due to certain circumstances, afterwards. The ground has to be prepared, and this means perfection through purification. For instance, as long as there is stubbornness in the soul, the experience and perception of absolute truth is impossible. Stubbornness and self-will are exactly what hinder the raising of your consciousness. Any imperfection is a hindrance. I cannot stress emphatically enough that only those who crucify their lower selves are ready for pure truth concerning anything in connection with the Creation and the divine. The fact that Christ is the messiah and that Christ is the most exalted of all created beings is a very important part of the great truth and of the history of Creation. Whether you are able and willing to recognize this does not belie the great truth. It does not mean, my friends, that you should pray to Jesus Christ. Only God the Creator should receive our prayers. What God expects from you and what is part of perfection and development, at least from a certain degree on, is gratefulness to the person without whose deed no one could come back into divine light, without whose deed the stream back to God would have been broken. Now some of you are still not ready for this decision and other things are still to be accomplished. However, when the time comes and gratefulness for the greatest deed without which you would be lost pervades you, then you will be able to give it to the one to whom it is due. That is God’s will. Think about all this, even if you do not recognize “officially” the Christian religion. Just as all religions have enough of the truth to further your purification, all religions also contain errors. It is important for you to follow only that which your spirit demands and which your higher self longs for. The rest will come by itself. But that does not change the fact that you should open your hearts and not put aside completely the one person to whom you owe most next to God. Do not disregard Christ so easily. I hope you have understood me, and I hope you do not misinterpret these words. There need never have been a split between Judaism and Christianity. This was never meant to happen by God or by the spirit world. And that it has happened is the fault of humankind. You have invented labels to which you attach special implications. For us, labels like Judaism and Christianity do not mean anything. Why Christ was born as Jesus at that particular time and among those particular people had its good reasons; it was intended that one and the same truth should expand and grow, and that no splitting should occur. Splitting is chaos; splitting is the nature of the Fall of the angels, or the result of the Fall with all its miseries and hatreds. Splitting is separation from God, and this initial tragedy, which took place long before the earth existed, keeps repeating itself in the course of time until the disease will be cured forever. Union with God, which is the goal, is the opposite of splitting and separation. The splitting between Judaism and Christianity after the life of Jesus was another fault grown out of the same bad root of the initial splitting from God. There should have been oneness between Judaism and Christianity, one wholeness and one completion. Since Christ represents such an important part of your returning to God, he deserves your personal gratefulness and some contact from you: you will not be able to reach God without him in the very last analysis. He is indeed the best friend you could ever have and he is your strongest helper. The answer to the question whether you can reach God only through him is “Yes.” For the constant denial of these facts would imply a stubbornness of your heart that is a symptom of imperfection; and as long as any imperfection is alive within you, you cannot unite with God. And now, my friends, I want to say to each one of you: Try, regardless of what religion you belong to, to open your hearts and your minds. Be broadminded! Do not leave the faith you are accustomed to, for that is not necessary unless you wish to do so. But consider that my words are true, even if you do not believe that a spirit talks to you, a spirit of the spirit world who has the insight and the knowledge that these are truths and not mere opinions, such as you on earth can have on these subjects. Even if you have doubts, and probably most of you here still have some, consider that it may be this way after all. What your fathers and forefathers or the people in whom you trust and who have influenced you in your life have said may not be entirely right. Certainly, they have spoken some truths, for truth exists everywhere, but no one group among all humankind has all the truth. You, who are spiritually searching people, should open the doors to truth, no matter from what side it may present itself to you. Do not be stubborn. Do not believe that this means giving in or showing lack of character, my friends. What an immature notion this is! 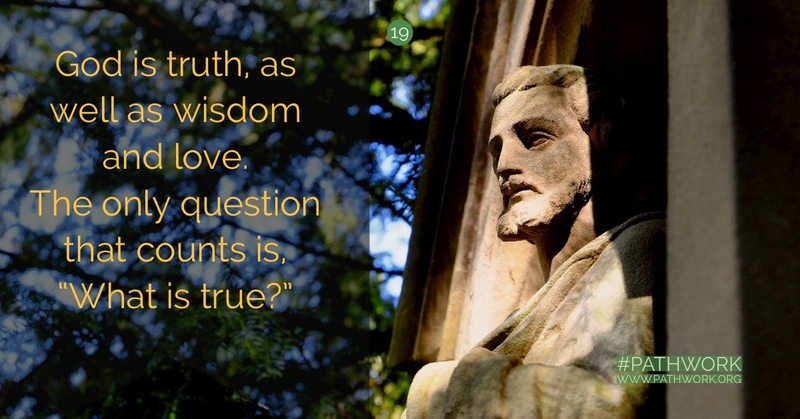 The question here remains as always, “What is true?” God is truth, as well as wisdom and love. If you deny truth for any silly, stubborn, and childish notion, you are thus denying God, at least in one aspect of your personality. The only question that counts is, “What is true?” Nothing else ever does, for any other question can only come from the lower self, even if clothed with apparently high-sounding motives.